Though we've designed Archives.com to be easy-to-use (even for beginners), we understand that learning how to use new tools can be a challenge. 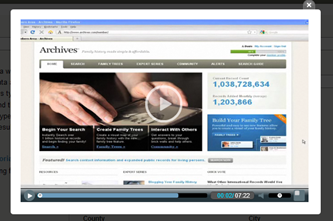 That's why we created two tutorial videos to help Archives users search in the member area, and create family trees. We've integrated both of these videos into the Archives.com member area, so they are available to you if you're lost or have questions. After watching a tutorial video you will be able to get started with ease and work more efficiently. Of course, if you'd rather jump in right away that's ok too! To play the Member Search video, log in to Archives.com and select the "Search" tab. Click the "Quick Tutorial Video" link on the left side of the page. 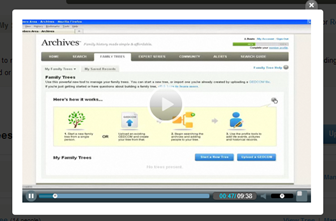 To play the Family Tree Tutorial video, log in to Archives.com and select the "Family Trees" tab. Click the "Watch the Family Tree Tutorial" link. We encourage you to watch one or both of these videos, and let us know what you learn! Are there any other topics you'd like to see tutorial videos on? Let us know by emailing feedback AT archives.com.